Pittsburgh got a president and a protest yesterday- US President Donald Trump and his family visited the Tree of Life synagogue, where 11 people were killed in the deadliest attack on Jewish people in America's history. His reception was mixed in a city where the mayor had asked him to delay the visit, until after all the funerals were held. Along with his wife, daughter and son-in-law, he placed stones and flowers at the memorials for each of the victims. Later, he visited wounded law enforcement officers at a nearby medical centre. Trump made no public remarks. 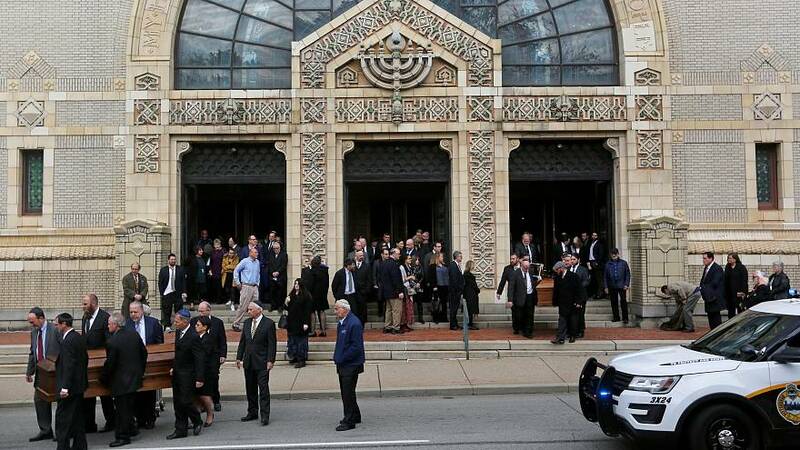 Outside the synagogue on the streets of Pittsburgh were the protesters. They held up signs and chanted, trying to make it clear that President Trump was not welcome. After this targeting of Jews, the President's previous lukewarm denouncement of white nationalism was at issue. "President Trump you are not welcome in Pittsburgh unless you fully renounce white nationalism," one protestor shouted. "We would like to ask President Trump to please stop with all of the hate speech," said protestor Jim Skiff. "And to please try to bring our country together. The schism appears to be almost insurmountable, and it is only with great leadership that we are going to recover from this type of an event. And I think the people of this country are really weary of the whole dialectic. We want people to come together in love and peace, and truly make America kind again. That is what we would like." And away from the protests and the President were the funerals. Some of the 11 victims of the shooting were buried with friends and family turning out to share their grief. Rabbi Jeffrey Myers is the spiritual leader for the Tree of Life synagoge. He was there when the gunman opened fire. He told CBC News he had received messages of support from, "Jews, Muslims, Christians, Sikh- every religion imaginable. With support, and love, which is so reassuring to me. It tells us that here in Pittsburgh, love will triumph. Hate will not triumph."